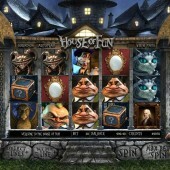 House of Fun is a 3D online video slot from BetSoft Gaming. Sadly nothing to do with ska-pop band Madness’s 1982 No.1 smash (if it was it would have been a nice accompaniment to Ash Gaming’s music-themed slot, Madness House of Fun), this Tim Burton-esque take on the house of horrors is more Rocky Horror than Rock ‘n’ Roll and sees you enter a mansion full of weird characters and puzzles. In fact, if you’ve played the equally eerie Halloween-themed slot, Halloweenies, you should get a good feel of what this is all about. 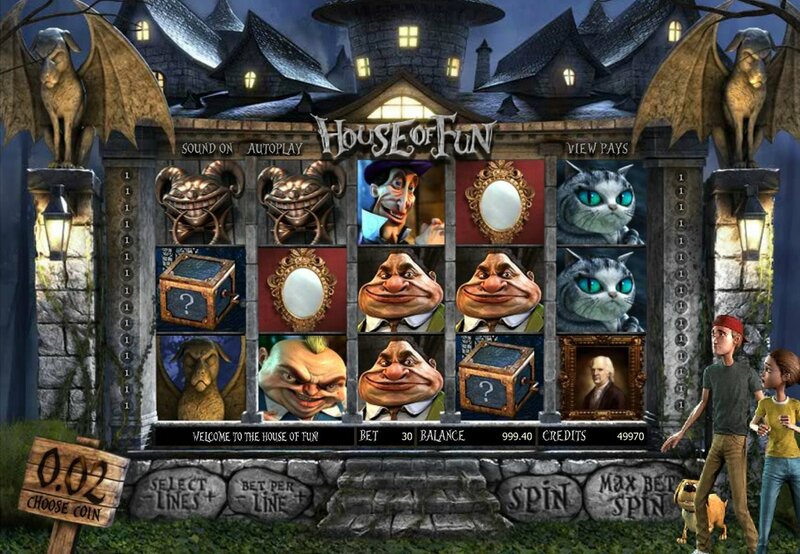 From the creepy vibe that you get when you launch this slot to the weird and random characters that appear on the reels. This is slot developer Betsoft Gaming at its 3D slot best with a distinct mood and atmosphere present from the very start. The reel spins on this 5-reel, 30-payline slot come with a macabre cranking and fairground noise, there are stone gargoyles and half-lit lamps adorning the reels, and an organ sound over the top of everything – all that’s missing is Eddie Munster. While we may not quite have the Munsters mixing it up on the reels, we do get the gargoyle, a magic mirror, candelabra, an evil-looking cat, a portrait that isn’t quite all it seems, plus various dodgy-looking inhabitants of our House of Fun. Three or more mystery box Scatters triggers the Jack Free Spins Bonus, where the center reel turns Wild during spins. There's a great chance to win big cash prizes on this feature. Three or more top hatted House of Fun owner icons on Reels 1, 2 and 3 launches a straightforward Click Me Bonus, where you just click on the symbols on the reels to reveal cash prizes. Finally, three or more Door Knocker symbols anywhere triggers the main Escape Bonus round. A Pick ‘em Bonus with five secret doors, it’s up to you to select the right door so our intrepid lost couple can escape. There is some really nice animation in this game – especially during winning combos (the younger brother who swallows a fish whole, leaving just the bones, is a nice touch) and when the couple make a dash for it after a scary winning combo lands on the reels. All in all, House of Fun makes for a nice addition to the raft of horror-themed fare doing the slots rounds at the moment.